The Federal Housing Finance Agency (FHFA) just released their Third Quarter House Price Index (HPI) data. 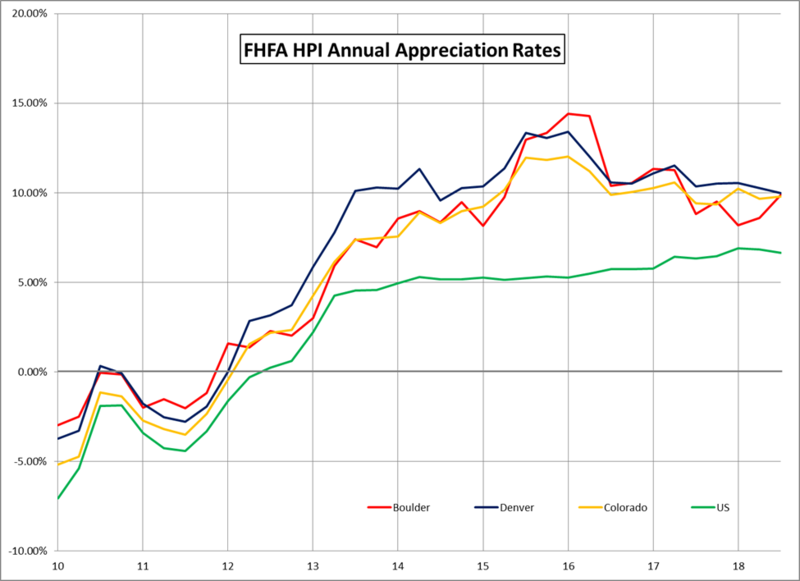 As you can see in the chart below, Boulder, Denver and Colorado remain off their 2016 peaks in annual price appreciation yet remained clustered in the positive appreciation area right around 10% annual appreciation, not too shabby. This might drop further as the latest quarterly readings were clustered around 1% appreciation for the Third Quarter of 2018. Interestingly, Boulder County had been lagging Denver and the rest of Colorado for the past year or so and has accelerated back to match their appreciation rates. While Boulder, Denver and Colorado have all sunk in the rankings for short term appreciation, the long term appreciation for these areas remains some of the best in the country. The FHFA HPI index is a very lagging indicator, we won’t see Fourth Quarter 2018 data until February 26th, 2019. 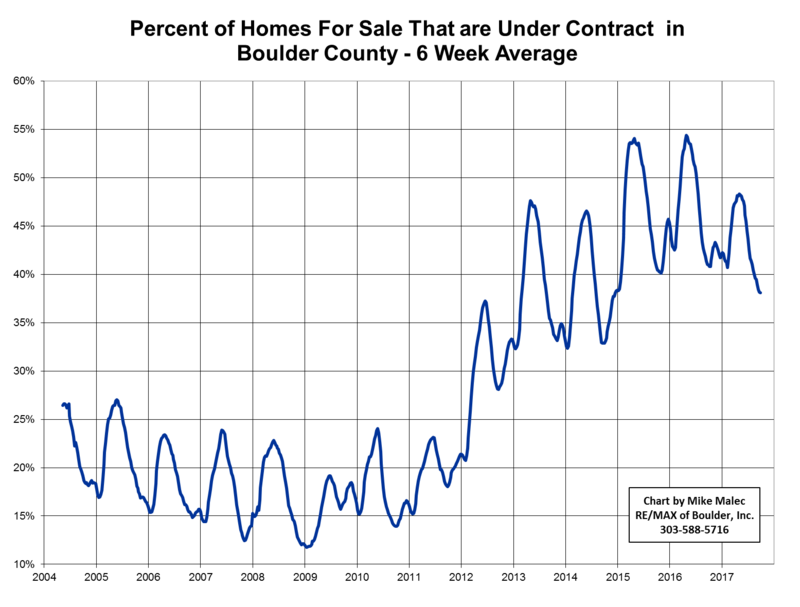 That data release will be very telling, was our Fourth Quarter as slow as it felt to some? Will we not be worried by then as the spring market frenzy cranks back up? All good questions that we’ll answer next year! The latest FHFA House Price Index (HPI) data came out for the First Quarter of 2018 and I thought I’d spend some time on those stats. 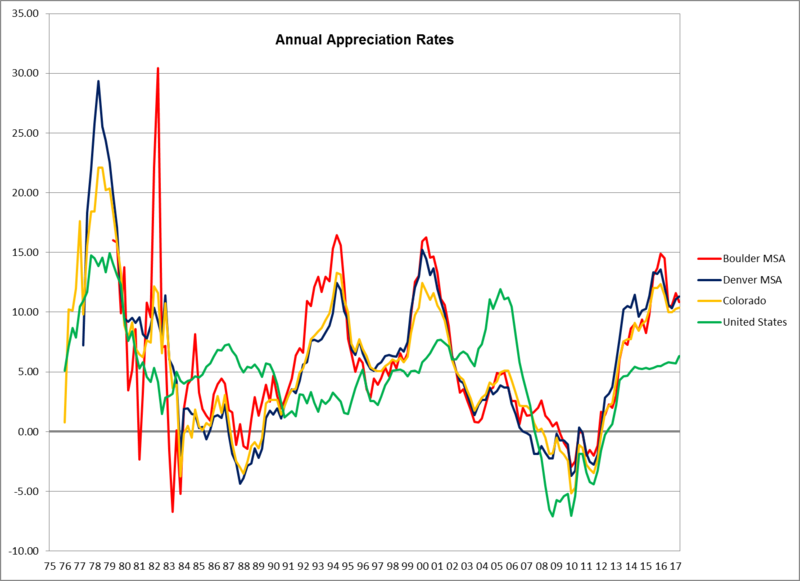 You’ll see in the chart below that the Boulder County MSA, the metro Denver MSA and the State of Colorado are all off their peaks in appreciation as our market shows some deceleration. Overall, the US is still showing increasing appreciation. 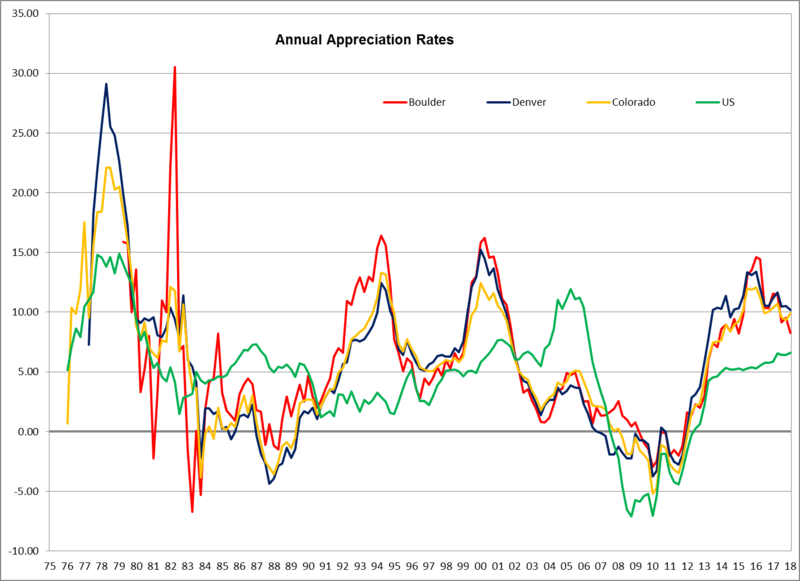 It’s important to note that even though appreciation is slowing, it is still positive, with Boulder County still experiencing 8.25% appreciation over the last 12 months. The Boulder MSA remains very strong compared to the other 245 ranked MSA’s across the Country as you can see in the chart below. As I’ve noted before, when you look at appreciation since 1991, our local MSA’s remain very strong, placing First, Second, Sixth and Thirteenth. Here’s a table showing how the different areas rank. It is interesting to note that the 10 metro County Denver MSA is showing stronger appreciation than Boulder County in the shorter timeframes. 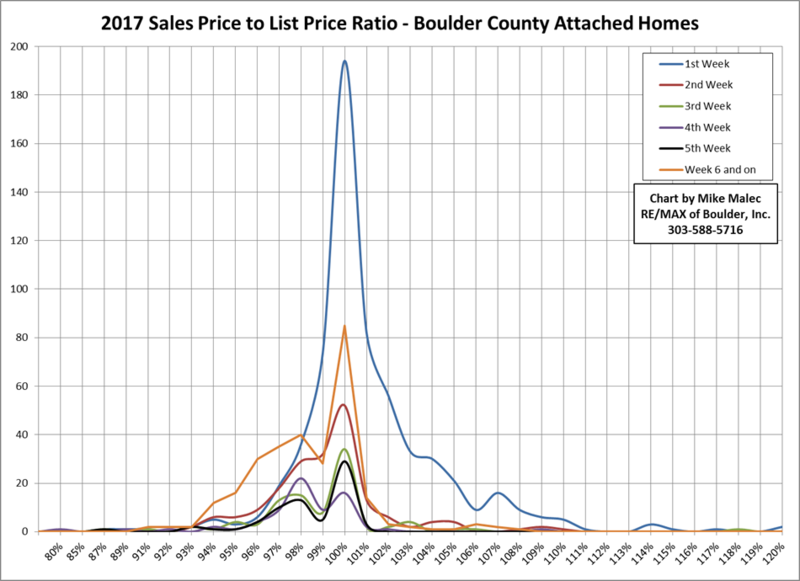 Since the Denver MSA has an overall lower price point than Boulder County, I think they continue to experience more of the frenzied appreciation we’re seeing occur on the lower end. Overall as a State, Colorado ranks second or fourth in the individual time frames. Surprisingly from our local perspective of a hot market, the HPI report still shows MSA’s across the country that are experiencing depreciation. Not everyone has been having the appreciation we’ve been experiencing since 2012. Of the 345 total MSA’s across the country, 19 have had negative appreciation over the last year or last 5 years. Still some scattered parts of the country that have suffering home prices. Two other items of note from the FHFA HPI report. 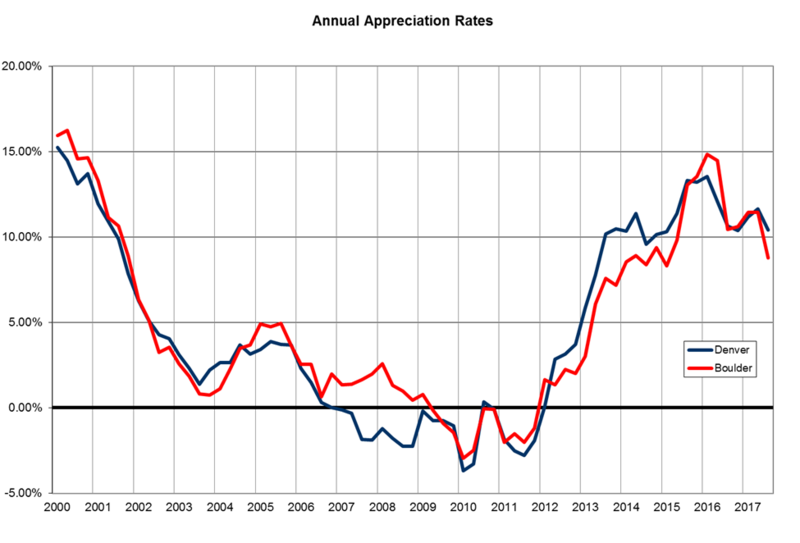 The rebound in national prices has now easily surpassed the peak in 2006 before the national downturn. We also finally have every State showing positive annual appreciation, but the rates vary from 0.9% to 13.7%. I hope everyone had a great Memorial Day! Last month we talked about what a high-end home was. 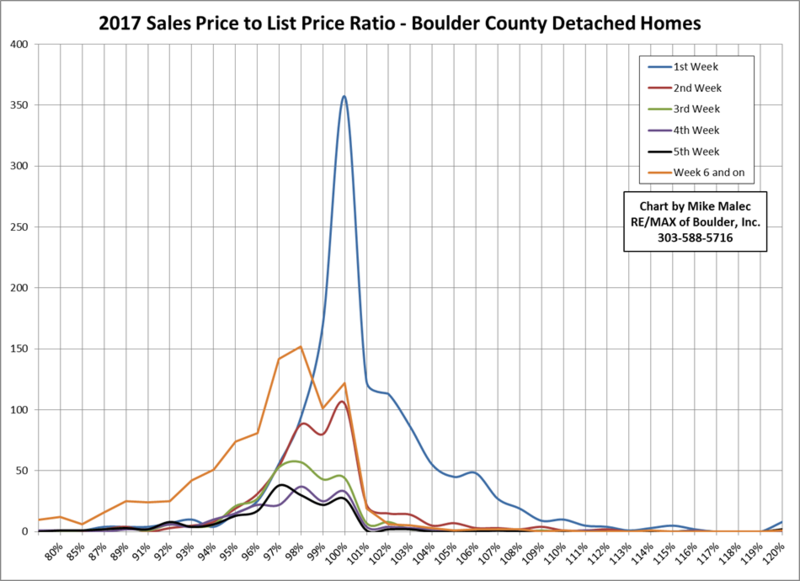 After looking at the data for Boulder County for the last 16 years, I came up with the answer that the top 3% of the market was the high-end. In the raw data, there was a hitch in many years when you reached that 3% level, a jump larger than other increments that implied there was something different as you moved from the top 4% to the top 3%. After looking at all of that data, I was also left with the curiosity to see how those price levels played out across the individual cities in the County. As usual, some time with my head buried in Excel and I have some answers and some further questions. Here are the breakdowns for the individual Cities in the County for 2017 Sales using IRES only data, the chart of Single Family homes first, Attached homes second and combined third. You can see that I’ve highlighted in yellow the sales price for each city that would have put that home into the top 3% of all 2017 sales for both single family and attached. The first thing I realized when I looked at this city by city data is that the hitch in my data at the 3% level has disappeared. When comparing prices within each city, apples to apples, there typically is just a smooth transition between the different price percentiles. An interesting result and one that throws out my assertion that there was something special about that 3% level. Another thing that jumped out of the data is that we live in an expensive area, I know, shocking news. 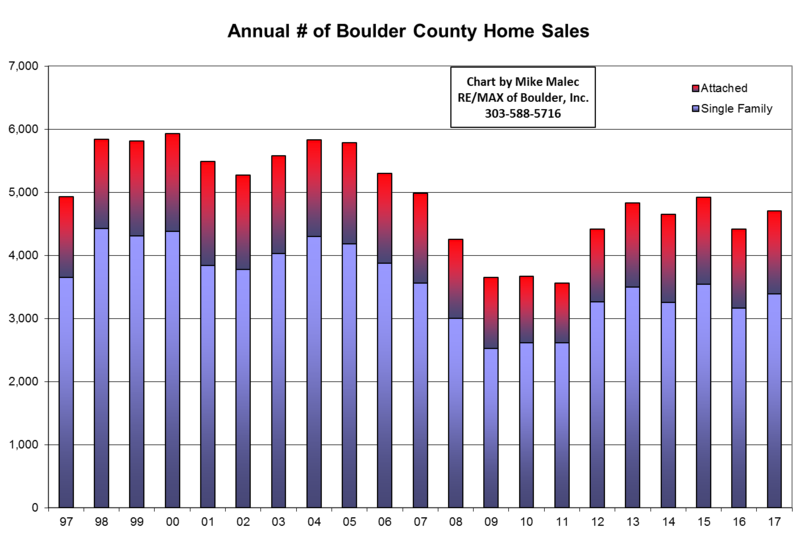 The Median Price for a home in the State of Colorado is $363,386 and for the nation as a whole, $213,146. The most affordable City within Boulder County is Longmont with a Median Price higher than the state median and far higher than the national median. 40% of City of Boulder sales were over $1M in 2017 and surprisingly to me, over 6% of City of Louisville sales were over $1M. The more I contemplated this data, I also came to the realization that comparing City to City also has issues. We know of many areas where a City line is drawn, and on the other side of the City line is a subdivision composed of homes in a much different price point that gets included into a different area. Think of Portico (Suburban Plains) versus SW Longmont, Boulder Country Club versus the rest of Gunbarrel (the City of Boulder parts and the Suburban Plains parts), and White Hawk Ranch (Suburban Plains) versus the City of Lafayette. One other area of question, the Suburban Mountains. I would bet without looking that most of the high-end sales in that area were for the very close in to Boulder properties and not the homes up by Allenspark. I’m sure there are other similar areas as well scattered throughout the County. So how do you account for those differences? Should those areas be lumped in with the nearby Cities or not? This is really more of comment on the Area/Subarea structure of the MLS data. Possibly something that worked well in the past but today it may just be causing more confusion. I’ve had a couple of weeks of thinking I’d answered something about the high-end, but further reflection tells me my definition doesn’t work. I’ll have to keep contemplating this question. This month I want to chat about an issue that has been bugging me for some time. What is a high-end property? 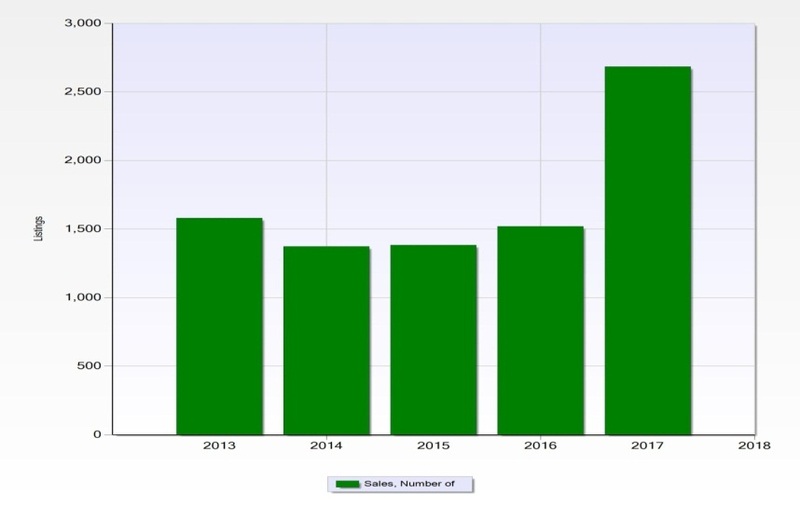 You’ll frequently see statistics, articles and analysis of the over One Million Dollar market, but with the average sales price of a single family home in the City of Boulder at $1.09M in 2017, does talking about the One Million Dollar market as something special or different make sense? 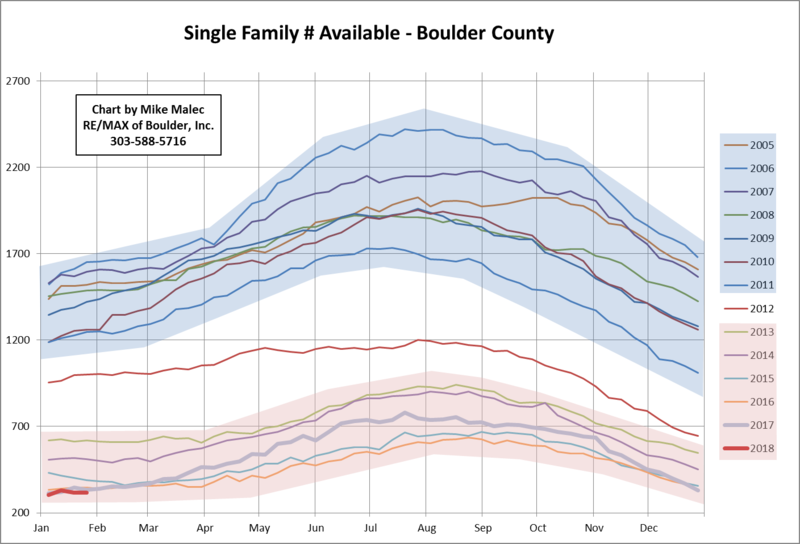 After all in the City of Boulder today, a million dollar home sale just means that sale is average, not something special. 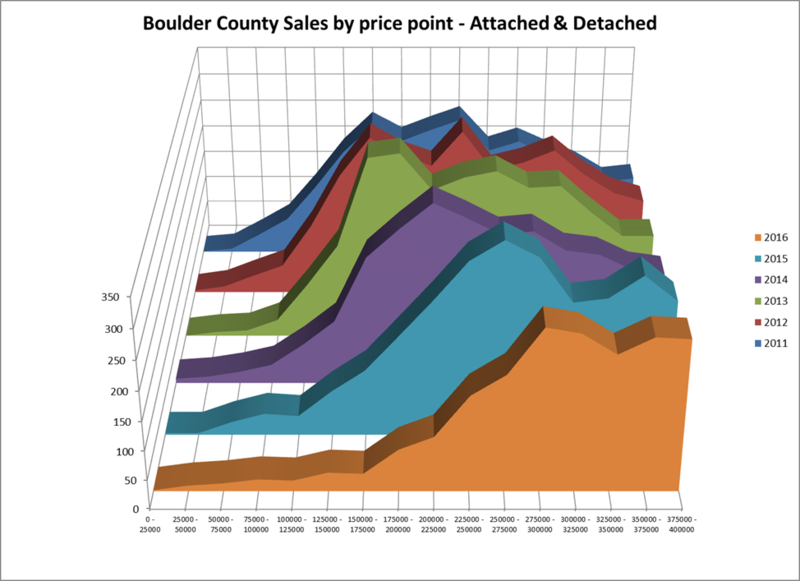 I already had all of the data for Boulder County sales going back to 2002 that were reported to IRES, so after some spreadsheet formulas I was able to start zeroing in on what a high-end property means today. 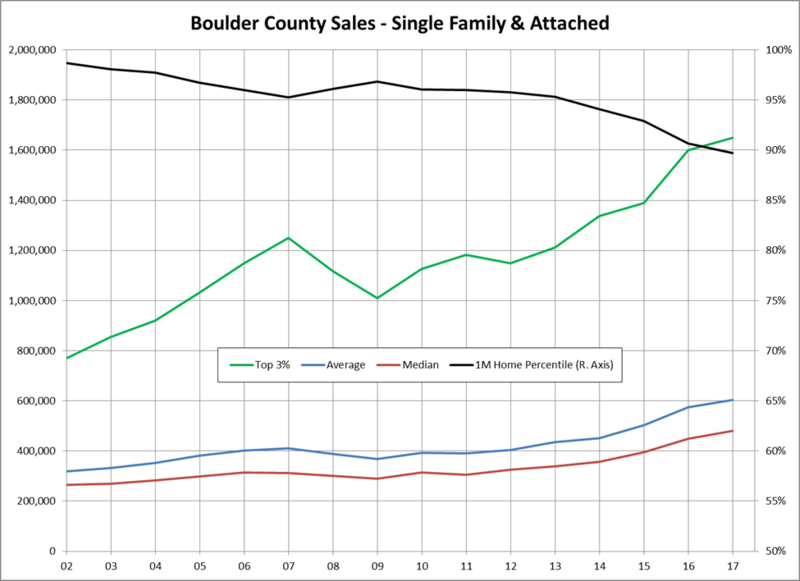 Back in 2002, a million dollar home sale meant that home was one of the top 1.29% of the sales across all of Boulder County. As of the end of 2017, a million dollar home sale means that home was one of the top 10.26% of the sales in the County, not nearly the same cachet. To be in the top 1.29% of the sales in 2017, a home would have had to sell for $2.1M. I didn’t take the time to break this data down into smaller market segments like individual cities, but looking at the overall County data, it felt to me like the top 3% of homes sales deserved the label of the high-end. 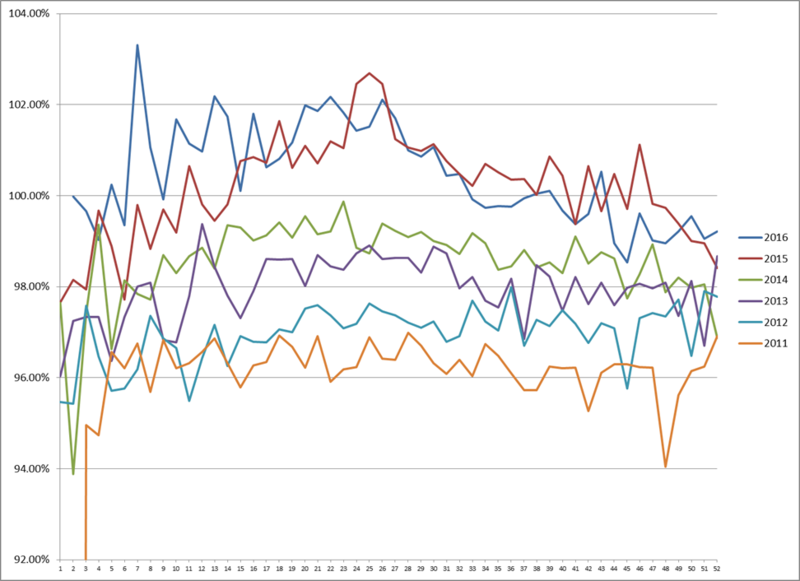 Some interesting things appear when I charted this data. The high-end reacts to market forces differently than the median and average price points, which makes sense. For most people, a home is a necessity, something that is purchased and held onto through good and bad market cycles. For high-end homes, we see the market downturns have a bigger effect as these homes usually aren’t a necessity but a luxury. Another interesting item in the data, the high end homes were up by 114% since 2002 while the average home was up 81% and the median home was up 89%. Some of this discrepancy may be due to Affordable Housing program homes that remain in the data, but this better appreciation rate for the high end of the market was a surprise. Another possible explanation is that the high-end of the market is a smaller market segment, in 2017, the top 3% of all sales was only 147 sales. One or two exceptionally high high-end sales could be skewing those numbers and in 2017, there was one sale for $13.1M, a 23 unit income property in downtown Boulder. As with any statistics debate, these numbers are County averages and may differ for your area. Obviously a high-end sale in the City of Boulder means something very different than a high-end sale in Longmont. I may dig back into the data and try to pull out what the top 3% of sales are for the different cities for a future article. Hope everyone has a wonderful spring! The shift in the market seems to be coming clearer as we move into the fall. Homes are taking longer to go under contract and inventory is building faster than sales. The shift is still patchy however in that certain areas and price points are still very active. I’ve even seen this patchiness within neighborhoods as some homes get scooped up quickly while others can linger on the market. Buyers are once again caring about finishes, upgrades and location when comparing homes. Homes with negative issues are starting to again be penalized by the market, just being for sale is no longer all it takes to move a home. One of the metrics that is displaying a marked shift that caught my eye recently is the percent of homes under contract across all of Boulder County. This summer, this metric didn’t rise above 50% under contract like the last two summers. It is also now displaying an under contract percentage that is below what we saw during any point in all of 2015 and 2016. A definite shift in the market. To try and display data that backs up what I’m feeling in the market, I also plotted the number of homes available for sale that aren’t under contract and the number of homes that are under contract for the same time period going back over the last 5 years. In the chart below you can see that the inventory of homes available for sale had been dropping for the previous four periods but this year has sharply reversed trend. 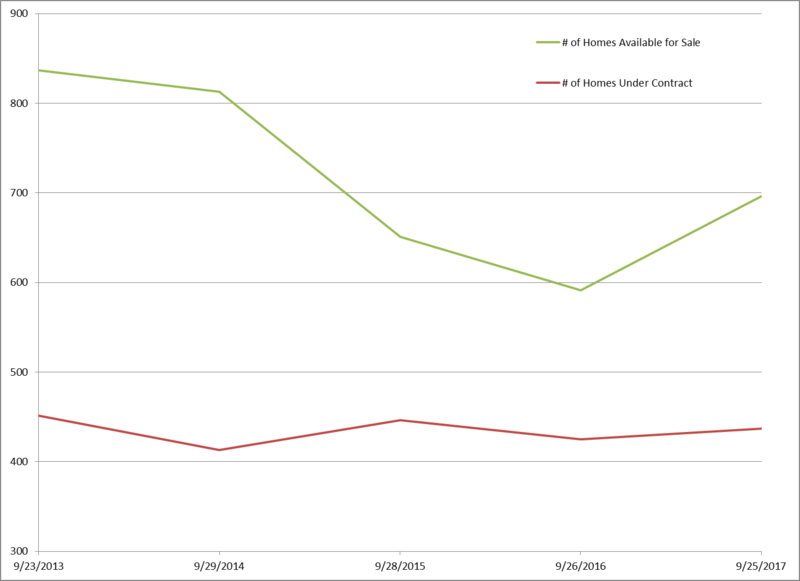 The number of home under contract meanwhile has stayed fairly constant throughout. Homes Available increased almost 18% compared to last year while the number under contract grew only 3% during the same time period. So, inventory is growing strongly while sales have only increased mildly. 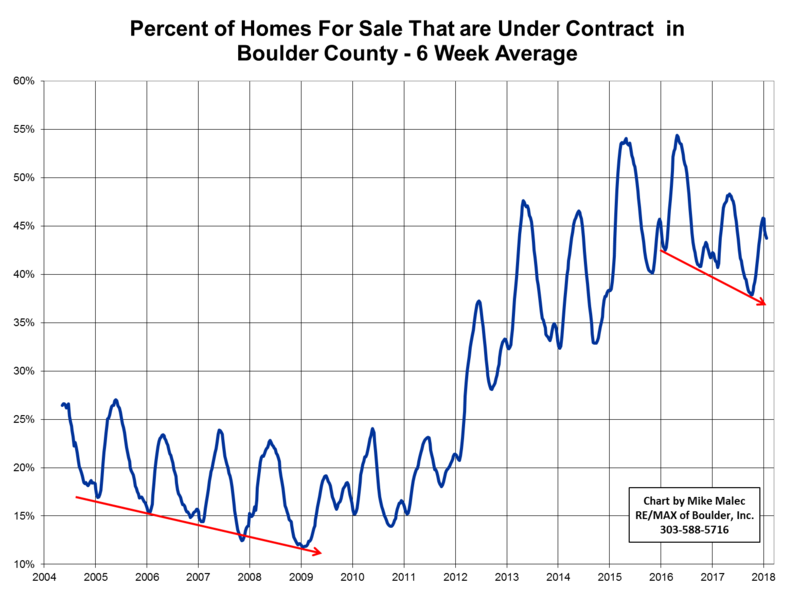 A big question though is this change in trend a seasonal pattern or indicative of a market shift. Since we’re comparing these numbers for the same date going back over the last 5 years, I don’t think we’re seeing a seasonal pattern, but I’m not sure we’ll be able to answer that until we see how spring of 2018 plays out. Enjoy the changing seasons!